Larval form of tapeworm Taenia solium causes cysticercosis in human. Larval form of this helminth can infest any tissue of the body, but it commonly involves central nervous system, subcutaneous tissues, skeletal muscles, and orbit. It occurs in human due to ingestion of contaminated water or unripe meat of pig (intermediate host). Cysticerci are spherical milky white cysts containing fluid and a single invaginated scolex with hooklets. When humans ingest eggs or gravid proglottids from the parasite Taenia solium, covering of the eggs is digested in the stomach and the larval form (cysticercus cellulosae) of the parasite is hatched. The larvae penetrate the mucosa, enter the blood vessels and lymphatics, and are distributed in the tissues all over the body. Cysticerci in the muscles generally do not cause symptoms; they present as nodules, can be felt as lumps under the skin, and tend to appear and disappear, or they can present as muscular pseudohypertrophy. We present a case of myocystecercosis of involving masseter muscle. 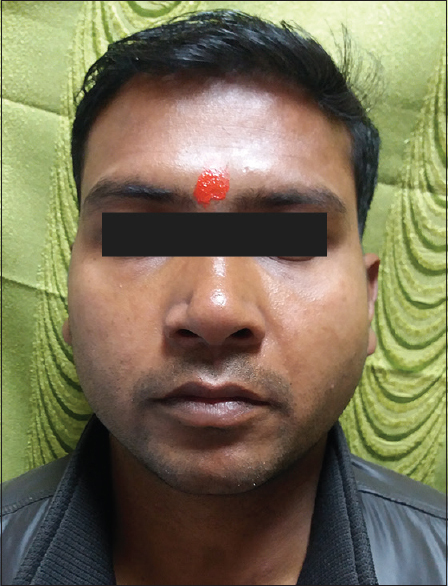 A 35-year-old male patient reported to us with diffuse swelling over the left side of face for the last 2 months. The swelling was gradually increasing in size. On palpation, a soft, tender, compressible swelling measuring 3 cm × 4 cm extending over the left side of face was observed [Figure 1]. Medical history was noncontributory. The patient was nonsmoker and nonvegetarian by diet. Blood investigations were within normal limit, except mild eosinophilia. Ultrasonography of the left side of face showed increased bulk of the left masseter muscle with heterogenous endotexture. 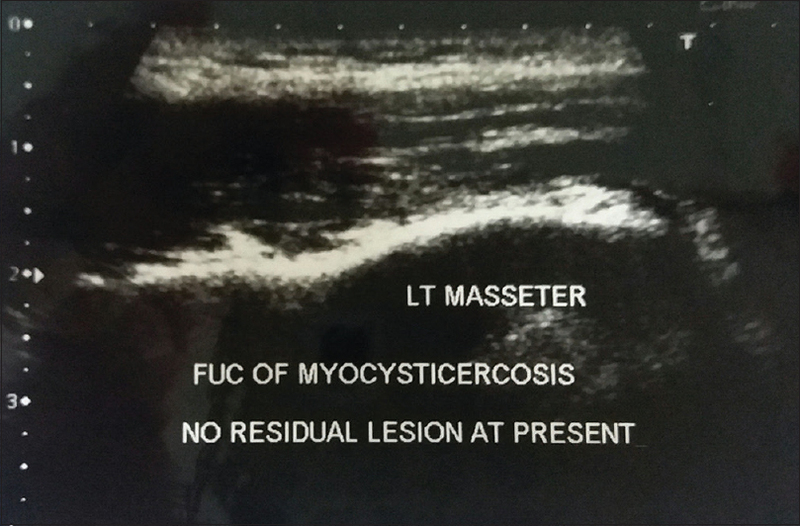 A cystic lesion with an echogenic central round avascular structure was noted in the left masseter muscle [Figure 2]. Contrast-enhanced computed tomography showed round hypodense nonenhancing lesion in the bulky left masseter muscle [Figure 3]. Magnetic resonance imaging(MRI) revealed area altered of altered signal intensity with increase in bulk of the left masseter muscle. T1 image was iso-hypointense and T2 image was hyperintense. Small cystic lesion measuring 7 mm × 5 mm showing signal of fluid was also noted within the fibers of the left masseter muscle. Small hypointense focus was also noted within the collection suggestive of calcification. 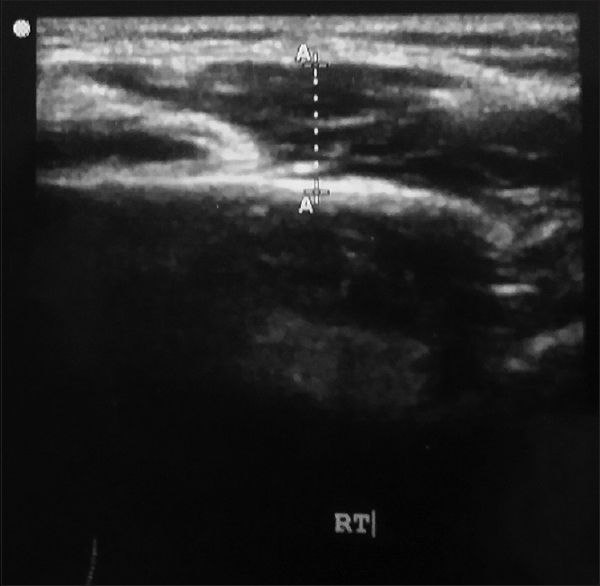 Adjacent subcutaneous tissue edema with reactive enlargement of the left submandibular gland and reactive lymph nodes at Level Ib, II, and III on the left side were also noted [Figure 4]. 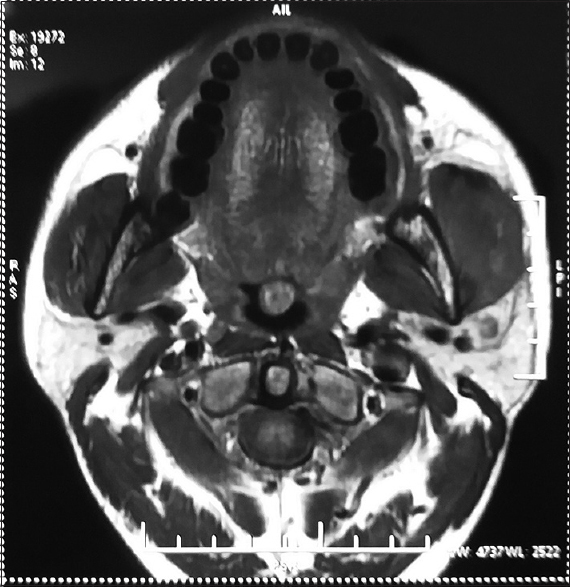 The radiological findings were suggestive of the left masseter myocysticercosis. The patient was advised for tablet albendazole 400 mg twice daily for 28 days. After 4 weeks, the swelling resolved uneventfully. Ultrasonographic study revealed that the complete resolution of cystic lesion and masseter bulk was reduced [Figure 5]. The patient is on regular follow-up with no recurrence noted in the last 1 year. Taenia solium is considered endemic in developing countries. Human is a definitive host in the life cycle of tapeworm. Humans are infected with eggs of tapeworm due to ingestion of contaminated water, food, and un/under-cooked meat of pig. After hatching of eggs in stomach, oncospheres develop from egg, penetrate into the walls of intestine, and get fixed there, and embryonated eggs and gravid proglottids are released in feces and deposited on soil; later, they are ingested by intermediate host (pig). The eggs release larvae within the intermediate host (pig). When these larvae infest striated muscle of pig, they form cysticerci. The cystic structure contains a small, invaginated scolex and neck resembling the adult form. Ingestion of undercooked pork by humans once again initiates the parasitic cycle, and larvae reach various tissues via blood circulation or lymphatic drainage and become cysticerci. The larvae can remain in this stage as long as 10 years without causing any symptom. Cysticerci can be found anywhere in the body in any tissue. The common sites of involvement included brain, orbit, skeletal muscles, and intraoral sites including tongue, lips, and buccal mucosa. Isolated muscle and subcutaneous tissue involvement by cysticercosis is rare. In our case, it involves the left masseter muscle without any neurological involvement. The clinical features and differential diagnosis depend on the number and location of cysticerci as well as the extent of associated inflammatory response or scarring. Neurological manifestations, known as neurocysticercosis, are most common and may manifest as seizures, hydrocephalus, and signs of raised intracranial tension. Skeletal involvement may cause transient tenderness and either muscular atrophy or hypertrophy. Cysticercosis in the muscle may present three types of manifestation such as myalgia, pseudotumor, and abscess or rarely the pseudohypertrophic type. In myalgia type, the patient complains of severe muscle pain due to acute inflammation caused by dead larva and leakage of cyst fluid. In pseudotumor or abscess type, the mass develops due to chronic inflammation with a collection of fluid around the cyst following intermittent leakage of cyst fluid. The third and rare pseudohypertrophic type develops due to calcification of scolex, thickening of capsule wall, and retraction of the cyst. Our patient also presented with mild swelling and soreness of the masseter muscle. Diagnosis can be done by ultrasonography and magnetic resonance imaging. Both conservative and surgical treatments can be done. Medical treatment with albendazole (15 mg/kg/day in divided doses for 2–4 weeks) or praziquantel (50–100 mg/kg/day in divided doses thrice daily for 2 weeks) has been recommended for neurocysticercosis and subcutaneous cysticercosis., Surgical excision can be done for localized lesion which is causing obvious symptoms refractory to anthelmintic drugs. However, we have managed this case with albendazole only. Myocysticercosis should be included in differential diagnosis of soft-tissue swellings of maxillofacial region although it is a rare entity. Worm infestation is one of the leading causes of malnutrition in children. Children usually complain of upset tummy and it usually ignored by us. Children should be taught proper handwashing technique to prevent contamination with these parasites. Green leafy vegetables such as cabbage should be washed properly before cooking. In places where people eat pork meat, it should not be served undercooked. Chandler AC. Introduction to Parasitology. New York, USA: John Wiley & Sons; 1958. Jacobs RA. Infectious diseases: Protozoal and helminthic. In: Tierney LM, Mcphee SJ, Papadakes MA, editors. Continuous Medical Diagnosis and Treatment. 45th ed. New York, NY: Mcgraw-Hill; 2006. p. 1463-536. Tschen EH, Tschen EA, Smith EB. Cutaneous cysticercosis treated with metrifonate. Arch Dermatol 1981;117:507-9. Schmidt DK, Jordaan HF, Schneider JW, Cilliers J. Cerebral and subcutaneous cysticercosis treated with albendazole. Int J Dermatol 1995;34:574-9. Kinnman J, Chi CH, Park JH. Cysticercosis in otolaryngology. Arch Otolaryngol 1976;102:144-7. 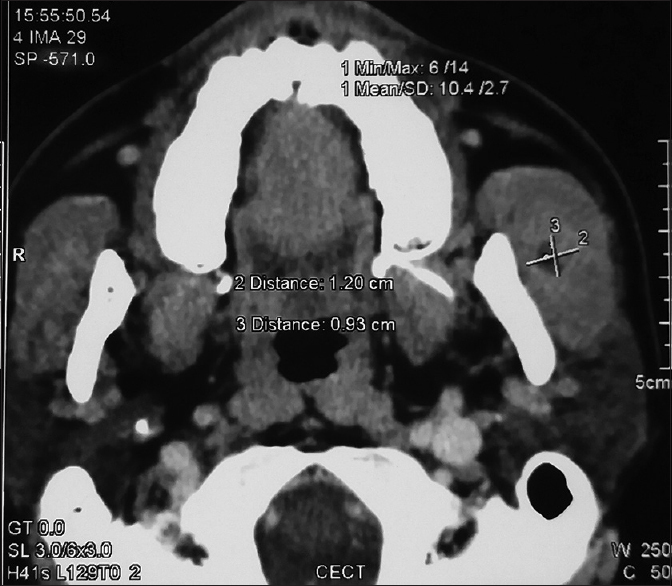 Mittal A, Das D, Iyer N, Nagaraj J, Gupta M. Masseter cysticercosis – A rare case diagnosed on ultrasound. Dentomaxillofac Radiol 2008;37:113-6. Sidhu R, Nada R, Palta A, Mohan H, Suri S. Maxillofacial cysticercosis: Uncommon appearance of a common disease. J Ultrasound Med 2002;21:199-202.